Providing you the best range of hydroxypropyl methyl cellulose solution, sodium hyaluronate ophthalmic solution, hyadroxypropyl methylcellulose ophthalmic solution 2ml and sodium hyaluronate with chondroitin sulfate with effective & timely delivery. 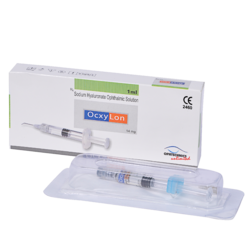 The ophthalmic viscosurgical device (ovd) is a sterile, isotonic, apyrogenic viscoelastic solution of highly purified, non inflammatory hydroxy propyl methyl cellulose (hpmc) solution with a high molecular weight greater than 80,000 daltons for intraocular use during the surgery of the anterior segment of the eye. At present, there are no known contraindications, when used by a trained ophthalmic surgeon, as indicated. Store at a temperature between 15o celsius and 35o celsius and a relative humidity less than 65%. Protect from freezing. 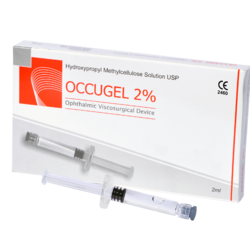 Occugel is a sterile solution of 2%w/v hydroxypropyl methylcellulose is available in 2 ml ,3 ml pfs in pouch pack. 5 ml vial with pouch in pack of ten. Packaging Details: 2 ml Prefilled Glass Syringe in pouch pack with 23G Cannula. 3 ml Prefilled Plastic Syringe in pouch pack with 23G Cannula. 5 ml vial packed in a box of 10 units. 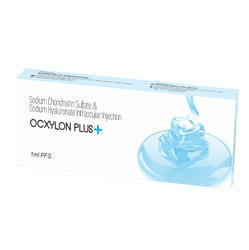 *Premium Injection grade quality Sodium hyaluronate material. *Opthically clear, highly cohesive, easy to aspirate. *Increased protection to Corneal Endothelium and Occular tissues. *Sterile, pyrogen free, non-inflamatory, double filtered. *Synthetic fermentation - no risk of viral infections. Packaging Details: Packaging- * 1 ml Volume in a convinient pre-filled GLASS Syringe. * Easy to peel Blister Packing. Optically clear, Sterile, non pyrogenic solution. Double pouched for your safety. 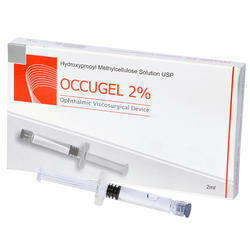 Hyadroxypropyl Methylcellulose Ophthalmic Solution 2ml Glass PFS comes in a pouch pack with 23G angular cannula. Packaging Details: 2 ml Pre Filled Glass Syringe in pouch pack with 23G angular cannula.